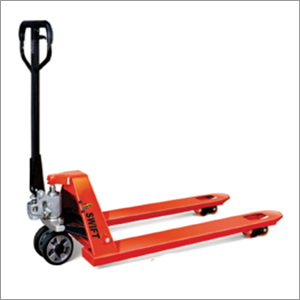 Having fork length of 1150mm / 1220mm, Hydraulic Hand Pallet Truck manufactured by us is very popular in the industry. Its main use is in warehouses for swift transport of products like paper rolls etc from one place to another. We assure clients that there is no scope of for breaking, as use latest techniques and processes to shape the hand pallet truck. We offer three versions of this equipment, wherein the capacity is 2000kg, 2500kg, 3000kg And 5000Kg respectively. It is provided with castor wheels which have good load bearing capacity. Also, unique mechanism of the truck ensures swift movement between place, without any hiccup. You can control its fork lowering speed via foot pedal and hand control.